For What It's Worth presents The Maharaj Trio! 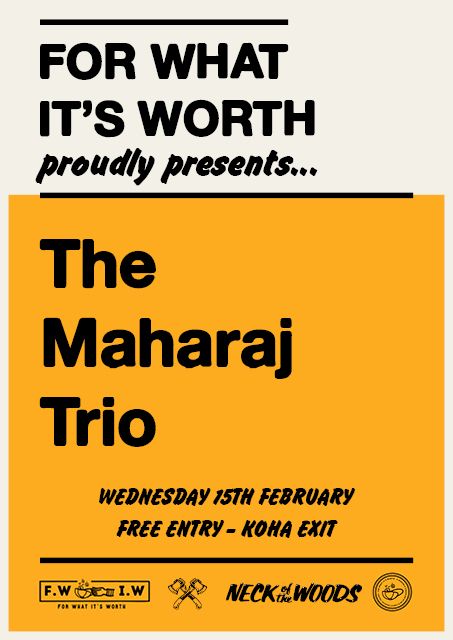 Right before their upcoming performance at Splore 2017 The Maharaj Trio are set to play a very special show at Neck of The Woods as part of our For What It's Worth monthly gig. This exquisite father and sons trio from Varanasi-India combines the skills and sounds of the generations before them, to create a unique performance that is a true experience to their audience. The band has performed at major world music festivals in Europe, Asia, United States, Middle East, Canada, and South America. The band proudly supports the organisations Misereor, Xertifix and P.V.C.H.R. to protect human rights and strongly fight against Child labour. Remember it's FREE ENTRY but please dig deep and show your support by giving a KOHA ON EXIT. 100% goes to the artist. For What It's Worth - supporting music together!